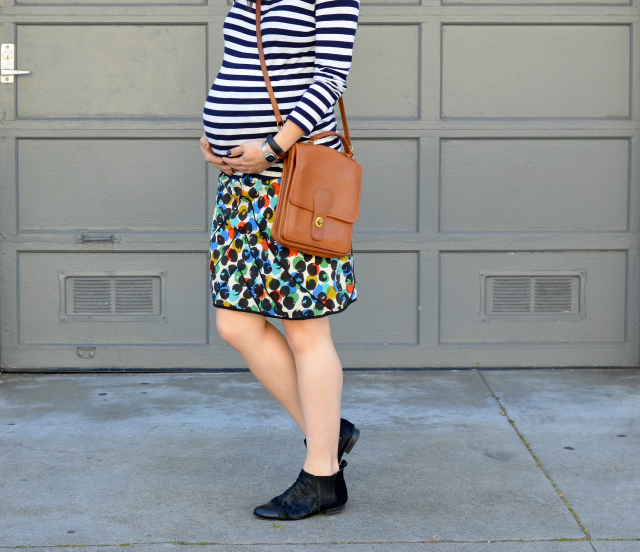 I haven't experimented much with patterns during this pregnancy. 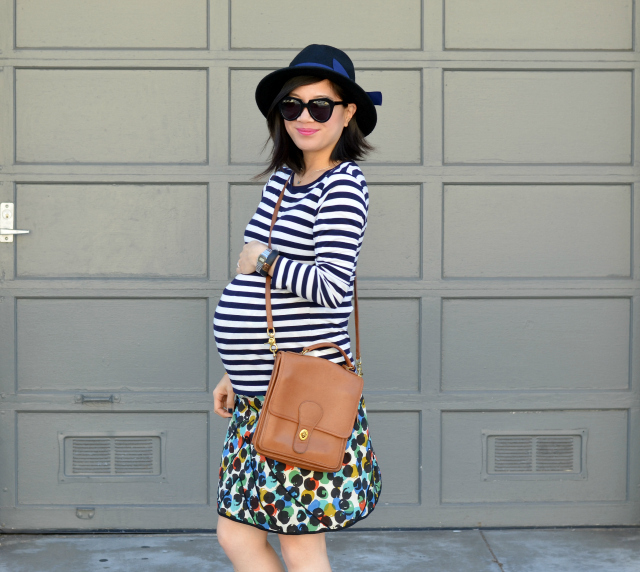 I've never been shy about mixing and matching before but through the course of this pregnancy, I opted for basics whenever I bought anything so I could easily pair them with items in my closet. 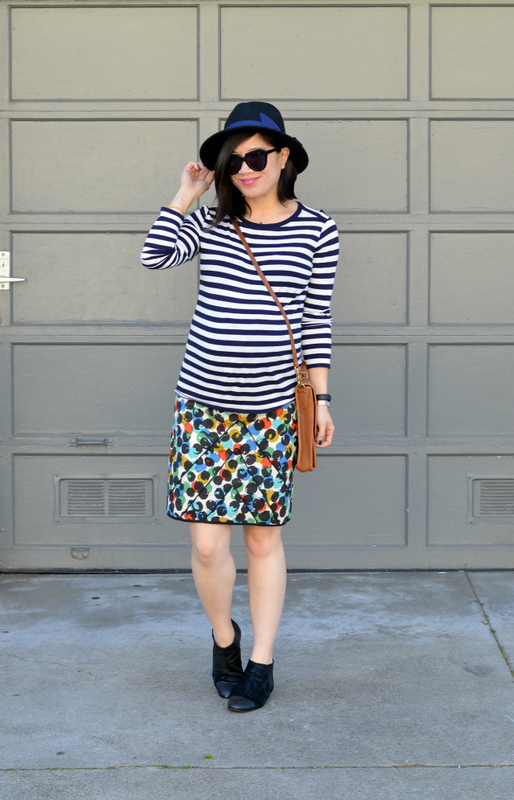 As practical as this route has been, I've been missing the bold colors and prints I typically wear, especially with the recent sunshine and good weather we've had in SF, So, I hiked up my unzipped skirt and wore my trusty stripe shirt for a good ol' pattern play paired outfit. I love it. It's very easy to fall into that basics trap, even when you aren't pregnant! You look very chic. This is such a cool look! Great job of mixing prints. I'm in love with the stripes trend this year...and this is a really great look to mix a classic print, with a more wild/fun one! 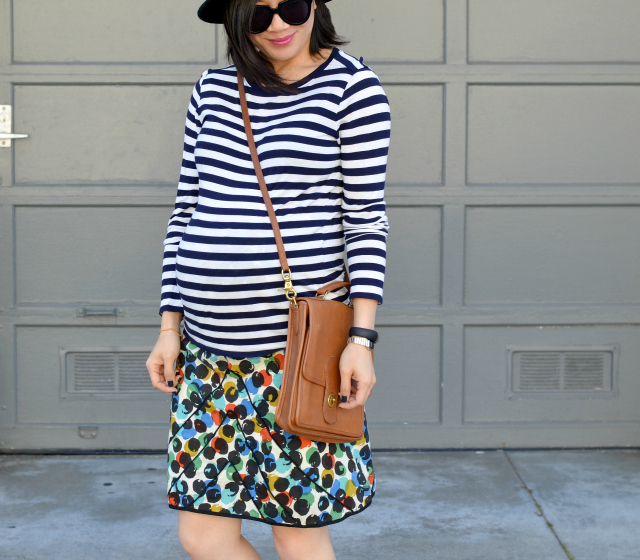 Love that hat with the striped top! So cute! WTG Nancy! Love the mix! That bag is great! Super cute! I'm working on pattern mixing .. it's a slow process .. lol. I do have fun with pattern mixing. This skirt is so fun, I love all the pretty colors in it. You look absolutely adorable preggers! Can't go wrong with a stripped shirt. Love the top!! And the cross body bag!! So cute! Cute, cute, cute! I love that skirt! Adorable! Loving the mixed patterns! You are sooo cute! 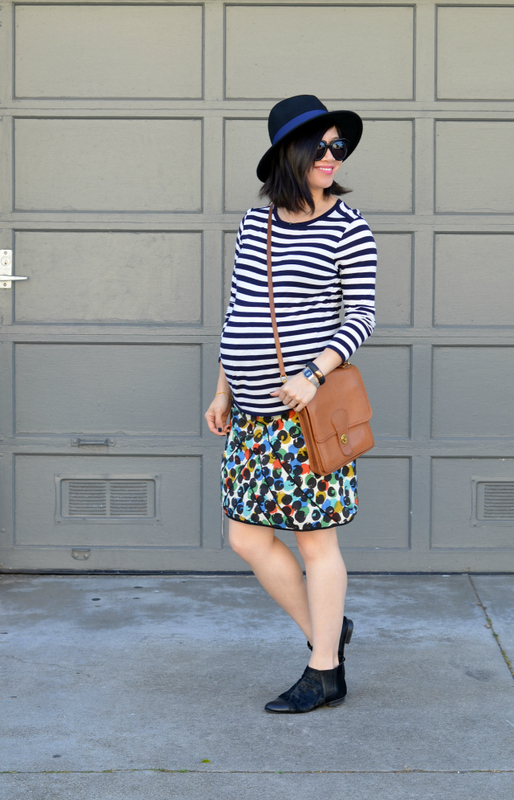 That skirt is such a fun print and color! I also loveee that striped top, it is super gorgeous!! I am loving this whole look. Have a great weekend! You look amazing in this outfit. The combination of floral and stripes never fails. Have a wonderful weekend! 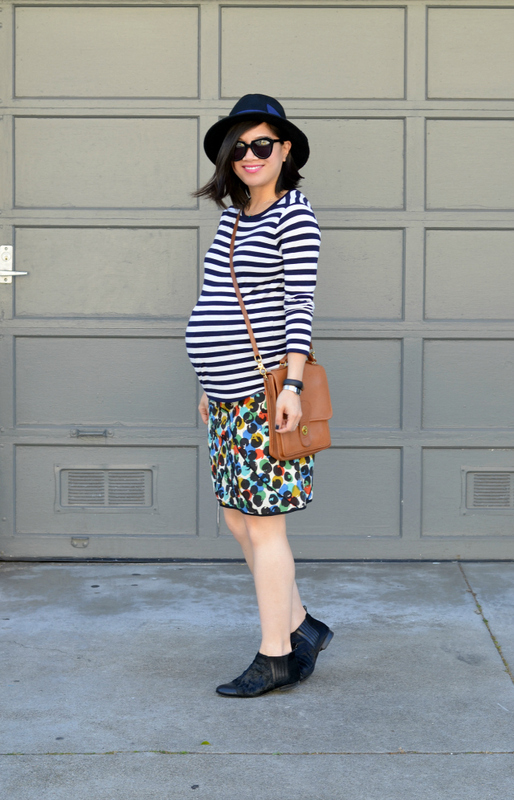 your bump is so cute and i love the pattern mixing! Love the stripe top, great outfit! That skirt is great! So brave to wear it unzipped- but I guess when you're about to pop you have to make it work! I'm loving the pattern mix! You look great! 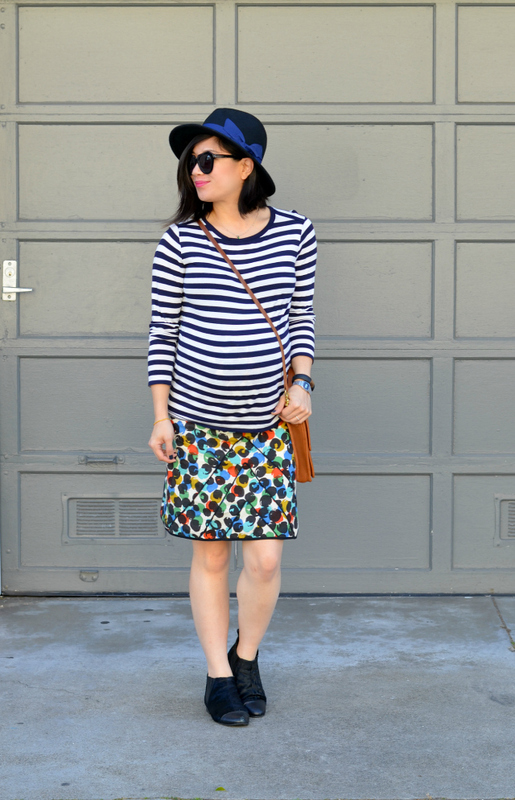 Really cute print mixing! Love your shoes too! Clever! Love the skirt, and the stripe combo, of course, is perfect. I am impressed you thought of this, it looks great and you seem to be so happy ! Sleep well, stay well, have fun! fun to watch the bBump grow! Cute!!! 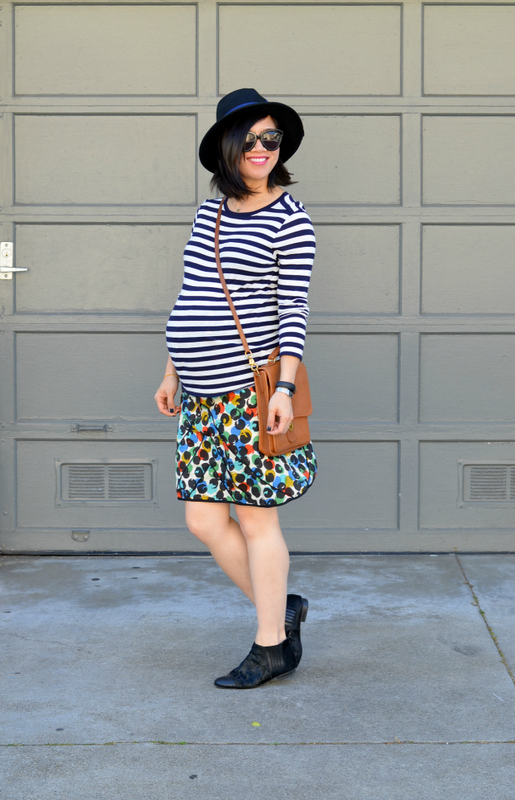 The print on your skirt is so fun!! The mix of the patterns is beyond perfect <3 You look gorgeous! You are soooo freaking cute!! I love this outfit, it's such a great combination. Who says bump-dressing has to be boring? Only someone who isn't a fashion blogger!! !